Ukko has arrived with the hot tub. 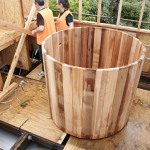 The hot tub itself is made from Canadian Western Red Cedar, and the crew from Ukko hoisted it up to the roof in pieces, assembling it once it was up there. 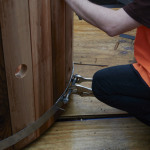 Completely handmade, it is just asking for the rooftop deck to be built around it. The hot tub is heated by the same method as the rest of the hot water system throughout the building, utilising the geothermal heat pump.